“If Jesus Christ is God and died for me, then no sacrifice can be too great for me to make for Him.” – C.T. Studd (1860-1931) was an English missionary who faithfully served his Saviour in China, India, and Africa. “He is no fool who gives up what he cannot keep to gain that which he cannot lose” — Jim Elliot, missionary martyr who lost his life in the late 1950’s trying to reach the Auca Indians of Ecuador. Consecration requires an unusual level of devotion. It requires sometimes that you shut down everything else to give God time and space in your life. Today, we see Jesus calling four men to follow Him. Jesus said to Peter and Andrew, “follow me and I will make you fishers of men.” These men were doing their business. This was where they made a living. Following Jesus meant they would no longer have that business as a security. Same thing with John and James, the sons of Zebedee, they were in their father’s business and they even had hired servants, meaning theirs was a prospering business. Perhaps they were rich kids. These men all left what they were doing and began to follow Jesus on the road and became his disciples. They forsook their earthly professions for a heavenly calling. Where they fools to do this? Were they impulsive, irrational or illogical? One thing is sure, they really had no idea what was waiting on the other side of their obedience or consecration, but they were willing to risk everything to follow the master. The book of Mark states their obedience in a very interesting way. 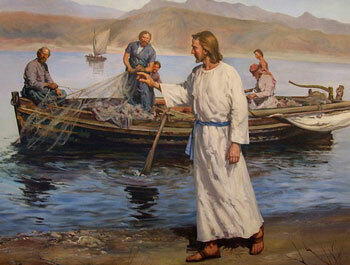 ‘And immediately they left their nets and followed him’. Did they know they were being singled out for great honour at the end of time? Did they know something more than the obvious? Whatever it was, they thought it was worth their while to abandon their trade, their family business and follow Jesus. They also did it as a matter of urgency. These men were no fools. They were people of insight and wisdom. Today, these men have their places in history and their places in eternity. They would sit on those thrones that Jesus promised. Read these words and be edified “Jesus said to them, “Truly, I say to you, in the new world, when the Son of Man will sit on his glorious throne, you who have followed me will also sit on twelve thrones, judging the twelve tribes of Israel. And everyone who has left houses or brothers or sisters or father or mother or children or lands, for my name’s sake, will receive a hundredfold and will inherit eternal life. But many who are first will be last, and the last first”. Let’s Pray: Father God, absolutely nothing is too much or too big to give to you. You are the owner of our lives and everything we are or we own belongs to you. Please give us the grace to give you our best at all times, in Jesus name we pray. Amen.